This is a baby soon to be weaned. It's father is green opaline pied, yellow face II, the mother is an opaline spangle, blue (has a mottled apppearance across the back). I've never had a bird that looked like this. It's a baby, might be female, not sure yet. I wanted to share the picture. 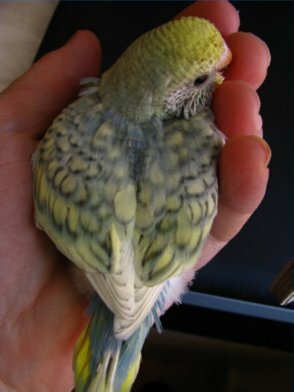 This is how my budgie Minnie looked as a fledgling. (Maybe her head was a little more yellow. )Anyway, 5 months later, she is still a beautiful little bird and a wonderfully entertaining pet! Pretty and a great personality - what a combo! What were the parents of your b aby budgie like? My parent budgies were a white df spangle female and a blue violet spangle male - no yellow on them at all.